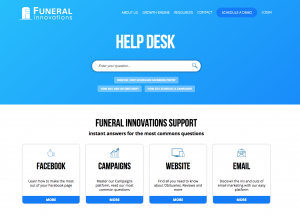 Funeral Innovations customer service support has received a facelift! We have created an online Help Desk for our clients. 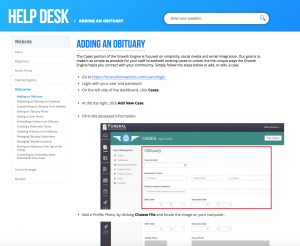 Simply visit www.funeralinnovations.com/home/help-desk/ to get all of your questions answered. You can find answers using our handy search tool or browse the helpful topics related to Facebook, campaigns, websites and email. You’ll be able to find answers and guidance on all things related to your account, your website, the Growth Engine and more! If you can’t find something, simply shoot an email to Support@FuneralInnovations.com and we’ll lead you in the right direction or call you back for assistance. We have already explained the frequently asked questions you may have, but we won’t quit! If we see a need to explain a common question that hasn’t been addressed, we’ll build it out immediately. Don’t hesitate to let us know where you have hiccups when using our services. We are here to make the offerings at Funeral Innovations efficient and easy to use.